I've had a Grendel since it the Howa Mini was launched and its a sweet round. Am playing with the 123gr Hornady Black ammo at the moment and it reasonably accurate, thou not overly fast at around 2600fps. And where the Grendel really shines is the lack of recoil, SWFA, Ive had 6.5 swede's and 260 rems and the Grendel is miles in front hen you stick it out the ute window. I don't think I actually chronographed the 95 Vmax out of the Creedmoor. I have kind of switch over to using the 90gr TNT Speer hollow point. Mainly because I can get them for 40 cents each. I have shoot a few out Grendel and Creedmoor. Creedmoor was 42.5gr 2208 in Hornady case. I had been using 8208 with the lighter bullets. But I think 2208 seemed better for me. My Creedmoor does have 26inch barrel. I am really actually quite interested to see how fast the 90gr TNT are travelling I reckon they would be spinning quite fast with 1-8 twist. Thanks for your post it has got me keen to get the Grendel out and do some shooting. I'll strap the chronograph on and post up some numbers. Hmmm the 90gr TNT weren't going as fast as I expected. The Creedmoor was doing 3180fps with 42.5gr Ar2208 and the Grendel was doing 2800fps with 31gr 8208. I was expecting the Creedmoor to be a bit faster and I was also expecting the Grendel to be closer to 2900fps. But the Grendel is still fairly impressive within 300 fps (nearly 400 in this case) but 10 grains less powder. To try something different I tried ar2207 in the Grendel (ADI manual has data) 25gr ar2207 doing 2700fps with respectable accuracy. Will test further. hey mate Ive done of heaps load development lately just not with a chronograph, got some good groups with the 107gr SMK but loads were a little compressed, been trying 100gr Amaxs again and found a few sweet spots, best was at 30.6grs of 8208. Also just stocked up on some 100gr NBT and some 100gr ELD-Ms which i hope to get going in the next few weeks. 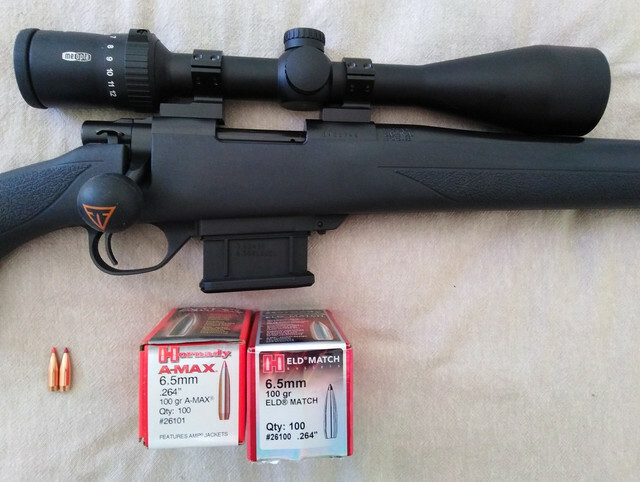 Bill wrote: hey mate Ive done of heaps load development lately just not with a chronograph, got some good groups with the 107gr SMK but loads were a little compressed, been trying 100gr Amaxs again and found a few sweet spots, best was at 30.6grs of 8208. Also just stocked up on some 100gr NBT and some 100gr ELD-Ms which i hope to get going in the next few weeks. Good to hear. NBT? Noslar boat tail??? I haven't being doing much with the Grendel. I've put it in a Boyds at one stock and in installed a 2lbs trigger Spring kit. I've hit a couple boxes of 100 ELD-M to try and just bought a box of the 123 ELD-M to try. I got got a little caught out with the 120 ELD-M. The projectile has a different profile. I just seated them to roughly mag length and they were well and truely stuffed into the lands. Yeah stuffing into lands is wee bit of a problem LOL. Ive just shot off 5 boxes of the 123gr Hornady Black match ammo (123gr ELD-M) and had no trouble shooting 5 shot groups around 0.6-0.75 moa. So im hopping to replicate with the 100gr ELD-M which look exactly like the old 100gr Amax ( which shoot very small groups in my gun). What sort of groups are you guys getting with the Howa at the range? I've got a heap of 129gr sst. Are they too heavy for Grendel? 129gr are getting a bit on the heavy side of things and speeds would suffer I reckon. I only started reloading for my grendel recently but it seems finicking with the barnes 100gr TTSX, needs to have a dirty barrel before tight groups appear. 8208 is the go to powder for the Grendel and Ive found it tends to shoot good groups when the case is full or with a mildly compressed load. Pretty easy to get it to shoot 5 shot moa groups and it can go 0.6 to 0.75 if you do your job, Ive had a few freaky small groups but the factory Howa stock and plastic floor plate mean they arent as regular as Id like. Sweet phark all recoil means you shoot 30 plus rounds and you just dont notice it. Cal-ApeR wrote: What sort of groups are you guys getting with the Howa at the range? I've got a heap of 129gr sst. Are they too heavy for Grendel? I tried some of the 129 soft point interlock projectiles early on. Just to see what they do. The velocity wasn't that impressive low 2000s but can't really remember. It might be possible to find a good load with 129gr SST. But the heavier bullet will be eating into the case capacity. My Howa mini only has the 22 sporter barrel. It seems to throw the first cold bore shot out of the group more than my rifles. And the skinny barrel does seem to heat up pretty quick. The other problem is the stock. I shoot off a bi pod and it is pretty easy to make the stock touch the barrel. That's why I've fitted the Boyds At One stock and 2lbs trigger Spring kit. To be fair I haven't done any real testing with the new stock and trigger Spring. I want to find a good load with 123gr protectiles either the 123 SST or ELD-M I'm hoping they are roughly the same. I've got a pretty good hunting load with 90gr TNT and I bought 800 or so. It is definelty capable of shooting under an 1 at 100 metres. No mentions of 6.5 in the Nowell Codex! Gaznazdiak wrote: No mentions of 6.5 in the Nowell Codex!